Ranbir Kapoor starred and Rajkumar Hirani’s directorial movie Sanju is released in theaters on June 29th and from then there is no looking back for the movie on the box office front. We all know that Sanju movie is based on the real life story of Bollywood star Sanjay Dutt. 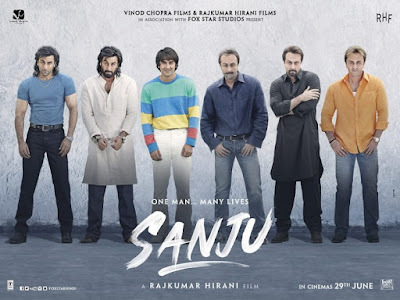 Earlier before release of the movie there were doubts on the movie’s success, but Ranbir’s exceptional performance and Rajkumar Hirani’s magical direction made Sanju movie a super duper hit. “Sanju” movie has satisfied both audiences and critics. The film is not only a commercially successful film but also got accolades from the critics as the movie has good filmy values. This movie is first of its kind as it is a biopic of a present generation actor. Usually biopics are made on older generation or expired people. The box office figures show it all about the commercial success of Sanju movie. It has entered into 300 crore club with ease in its third week itself. The movie is made on budget of 80 crores which includes promotional costs as well. As of date according to box office reports the movie earned 319 crores. It means it earned a profit of Rs 230 crores till date. This Friday Janhvi Kapoor and Ishaan Khattar starring movie Dhadak is all set to release. We have to wait and see how it will effect the running of Sanju. Until then there is no stopping.